Maria McElroy, the creative genius behind Aroma M, makes her beauty oils in small batches with the highest quality natural ingredients. They are not only of superb quality, but luxurious and glorious to use. I love her beautiful Camellia Hair Oil (reviewed here) and her Camellia Face Oil (reviewed here and selected for my Top 12 Beauty Oils post here)- therefore it should come as no surprise that I am likewise thrilled by her gorgeous Camellia Body/Bath Oil. I love to apply Aroma M Beauty Camellia Body/Bath Oil to slightly damp freshly washed skin, and I luxuriate in the silky texture and delicious scent as it quickly sinks in. The scent itself is a beautifully refined floral that is both intoxicatingly beautiful and simultaneously soothing and sensual. It's one of those scents that gets under my skin causing me to crave it and seek it out. I even apply it on my wrists like a perfume oil, when I don't need the hydration, just to be able to inhale this glorious aroma! Aroma M suggests that this is, "the ideal liquid moisturizer for hydrating skin," and it really is! My skin is left indescribably soft, smooth, hydrated and luminous. I also like to use this gorgeous elixir on my hands and cuticles because it quickly hydrates and heals dry skin. The fabulous blend of essential oils that have given the original aroma M Beauty Camellia Face Oil its cult following have been rearranged as a heavenly veil to caress all the skin that needs quenching. This luxurious and fragrant Body/Bath Oil treatment combines beneficial emollient organic oils (Camellia Seed Oil, Grape Seed Oil, Golden Jojoba,). It is charged with the synergy of essential oils derived from flowers and other botanicals (Jasmine, Geranium, Frankincense and Neroli.) with the addition of heady Moroccan Rose Oil. This elixir effortlessly melts into complexions that are normal, oily, or dry without leaving any residue, and adds the experience of uplifting fully natural fragrance to soothe the mind and heart, moisturizing the skin, leaving it soft, supple and lightly scented. To create a luxurious moisturizing bath add a tablespoon of this luscious oil to a cup of milk, and soak in it's near magical powers. This is the ideal liquid moisturizer for hydrating skin to create a luminous, complexion. Maria McElroy of Aroma M Beauty has combined her experience in the beauty rituals of the Japanese Gion Geisha and Western aromatherapy traditions to create a product for a beneficial and beautiful beauty ritual that combines the best of both traditions. Ingredients: Organic Camellia Seed Oil, Grape Seed Oil, Organic Golden Jojoba Oil, Organic Essential Oils of Jasmine, Neroli, Geranium, Frankincense and Moroccan Rose Oil. Camellia oil: Camellia oil has been a Japanese beauty secret for centuries, and considered to be so beneficial and valuable that has become a symbol of wealth, virtue and happiness. It is made from cold pressed Japanese camellia (Tsubaki) buds, which is a member of the tea family. It is very lightweight and absorbs well. Camellia oil is lighter than oils such as shea butter and jojoba, and is hypoallergenic and will not clog skin pores. It is a superb daily moisturizer and emollient, protecting skin from chafing and drying out, and replenishes vital nutrients, as it offers a variety of healing, nourishing and stimulating properties to purify and protect the skin. It restores skin's pH balance and shields skin from penetration of environmental pollutants. It acts as a natural sun block by forming a barrier against harmful UV rays. Golden Jojoba Oil: Jojoba oil naturally heals skin damage with its beneficial stimulating and purifying properties. It is wonderfully effective in sustaining the skin’s natural moisture as needed to prevent dryness. The extract of the seeds mimics the natural oil produced by sebaceous glands in the skin and is absorbs quickly to impart a velvety finish. Jasmine Oil: This heady fragrant essential oil helps both in the reduction of wrinkles and fine lines in mature skin and will also soothe youthful sensitive or oily skin. The fully natural and organic fragrance of this essential oil has a calming effect on the central nervous system, which supports the skin’s well being, and may aid in relaxing the facial expression. Geranium Oil: Fragrant pure Geranium oil is astringent and tonic, and stimulates circulation. Its herbaceous fragrance reduces stress and anxiety, and therefore calms the skin. Geranium oil will also soothe over sensitive skin and prevent breakouts. It aids in balancing the hormones and balances both dry and oily skin. Frankincense Oil: Frankincense is a powerfully beneficial and fragrant skin rejuvenator. It is antiseptic and anti-inflammatory and can balance oily or dry skin. It improves skin's tone and texture and speeds healing and is helpful with acne, and blemishes. It can reduce the appearance of scars and age spots. Because it encourages new skin cell growth it is excellent for fighting the signs of aging. Neroli Oil: Neroli oil is a fragrant skin cell regenerator and also helps the skin retain moisture. It has a smoothing effect on the skin and helps heal scar tissue and fights broken capillaries. It is beneficial for dry and aging skin because it aids in skin cell growth and also improves skin's elasticity. Moroccan Rose oil: Moroccan Rose oil is one of the world's most expensive and revered essential oils. We discovered this perfect Moroccan Rose oil on our adventure to Tangier. Stunning and exotic, it combines healing and soothing properties. This heady sweet and floral fragrance is one to make you swoon. Overall assessment: Simply put: this is an utterly swoon-worthy luxury body oil! If you love luxury oils, then you really must try the gorgeous handcrafted creations from Aroma M.
The price is $60.00 for 100ml. 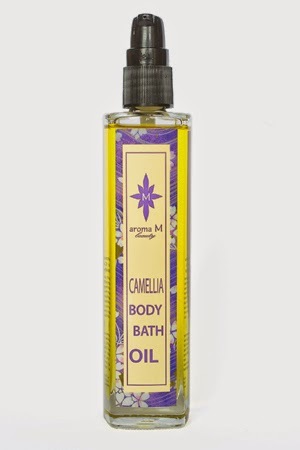 Available from Aroma M.
Oh I love all things camellia oil! This sounds like a wonderful bath oil. Ooh, I was just readong on BrushandBullet the other day about camellia face oils! I love camellia flowers, so there was instant appeal, LOL!